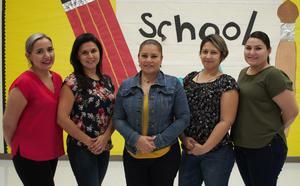 On Tuesday, September 18 our PTO held its officers election during the PTO meeting. The elected and re-elected officers are as follows: Adriana Gamez, President; Yenny Galvan, Vice President; Aglahe Ramos, Treasurer; Yadira Gonzalez, Secretary; and Nemesis Herrera, Parliamentarian. Congratulations to the 2018-2019 PTO Officers.